Is that a test shot ? Looks great to me. Yeah! This is the one I've been wanting! Now if they will do a stepside version of their 69-72. I've been looking forward to this one, also! Will there be a styleside bed for this one, or only the stepside? Either way, I want one!! Well, the same Flareside (Ford's term for the stepside bed) went, virtually unchanged well into the 70's! Well, this style Flareside bed was offered well into the 1970's on the F-100! Has Moebius explored the possibility of adding the notched fender? I hope this is a very early test shot. The entire green house looks wrong. I see a couple of small things that would need some work, the curve at the back of the roof down to the B pillar looks a bit to long, also, is that a body line in the roof or a light glare? Never seen one with a body line on the roof. Bottoms of the front fender too square.. Theres more, but what the hell, none are perfect... So, break out the sand paper!! Looks fine to me, good lord is no one ever happy with anything anymore??????????????????? 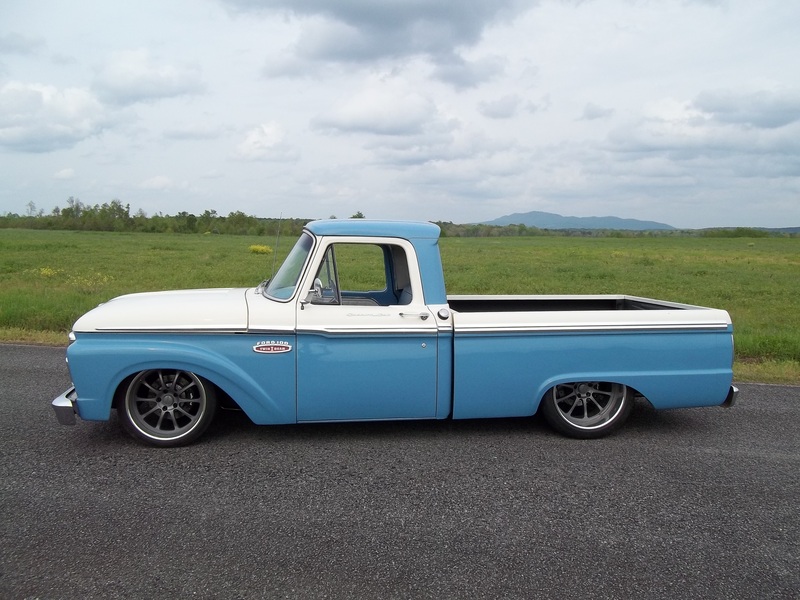 I guess it does to those that don't know what a mid '60's F-100 is supposed to look like. To those that do, it's pretty disappointing. The recess in the center of the roof is the only thing they got right. The rest of the roof is a mess. The worst offender is the brow above the windshield. That will take a total rework to look right. Plus, make a new windshield and gasket. The A pillar looks to be too upright. Then, there's a gap in the rain gutter. The trim is too thick /clunky and has an extra lip along the top that isn't present on the trim or body. The front fender bulge is flat looking. That's just what I can see from the one photo. That's enough for me to know that I won't be buying one unless some vast improvements are made. I looked at photos online. It isn't that bad. I guess I know nothing about it even tho I spent my senior high falls in the passenger seat hauling feed and hay. A good friend of mine that is quite knowledgeable about them thinks it's not all that bad. No kit is perfect, but a select group seems to think they should be. Maybe Mobius should have consulted them. Well for the two no sales there are two sales. For all of the nitpickers out there, if a model sitting on a table or where ever you choose to display it, looks like what it represents. and someone knows what is then its good. Everyone should be happy that any one is still trying to bring new kits to the market, not just repoping the same old kits in new boxs. The picture is of a test shot model. It is not the final version being offered to the public as the mold may be "massaged" a bit before it is finalized for production. Obviously, none of those who claim that this is inaccurate have never measured any dimension of the real truck, which I, along with Dave M. of Moebius did do. 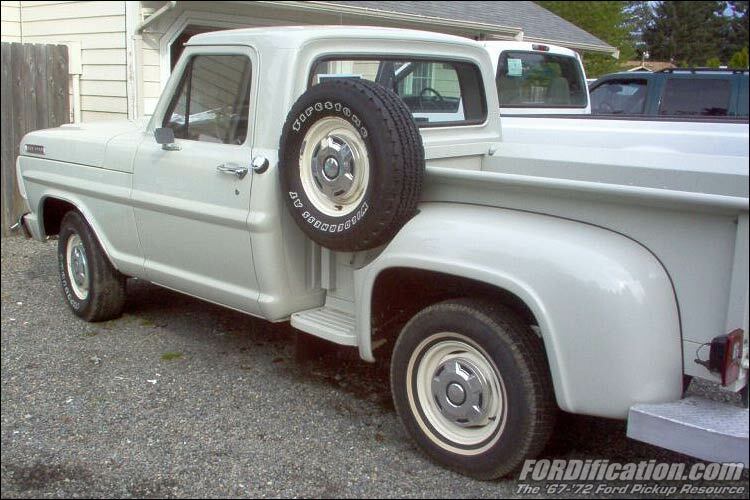 Together, we sought out, found a dealer in used, but restorable cars and trucks, who had at least 6 of this vintage F-100, drove about 300 miles, spent an entire afternoon with camera and measuring tape and a carpenters' rule in hand, and also in the photo's. It takes that sort of reference photography, not some "beauty shot" that an owner or enthusiast takes, of any vehicle to get the information needed to create a model kit, truthfully. Nearly a thousand photo's, many of them with a measuring tape and/or a carpenters' rule clearly slapped against the subject do exist. Styleside bed is already in the tooling. I for one appreciate the effort . I can live with all of it .The only real correction I would mention is the curve at the top of the windshield corners . Unlike another model we all know this one has the window a Tad too tall ? Maybe it's me . But the rest looks tweakable as is . Thank You for your efforts .I will buy one if the styleside/large window is offered . I mean just what I asked. They took hundreds of detail pictures and measurements. You are showing a picture that is not even the same angle as the test shot. I have shown that test shot and your complaints to people probably more knowledgeable than you not on any modeling forum and they don't see anything of concern. Some people just seem to enjoy finding faults. Some look for the good. It is a much happier time doing the second. BTW, no one is taking stabs, we are simply disagreeing. You know, I was done with this and then you go and start in on my knowledge of 61-66 Ford trucks. To say this without even knowing me is just crap on your part. So they measured and photographed a truck or two. Its still not right.....I happen to own several of the 65's, my daily driver is a 63 Uni. My father has three 64's and a couple of F250's. Been around these truck for 62 years now. So knowledge? Yeah, I have a bit. To Art. how about some more pictures please. Just because you spent one day and took photos of the truck doesn't make you or anyone else more knowledgeable than someone who owns or has owned the actual truck. That's obvious in the photo if you think it's accurate. I don't need a measuring tape to know that the drip rail doesn't wrap straight around the windshield brow. It turns and curves upward at the A pillar. It doesn't run on the same plane as the top of the door. The windshield is taller than the top of the door frame. That's a fact. Not an opinion. I also don't need a tape measure to see that the shape of the front wheelwell opening/fender bulge is wrong. I would need one to check the height of the roof which looks too tall. Even though I can't see the grille, I would bet my kit stash that it will be inaccurate also. Moebius didn't get a single one right on the '69 - '72 F-100's. I wish I could say I expected better from Moebius. But, it's pretty much exactly what I expected. I'm sure the people who paint and assemble kits will be happy with it and lap it up like Koolaid and say they "don't see anything wrong with it", "it doesn't bother me" or the most famous, "are we modelers or assemblers? , "we can fix it". With all the available technology today, there's no excuse for an inaccurate kit. Sure, no kit is perfect or 100% accurate. But, a lot of them are head and shoulders above this example. 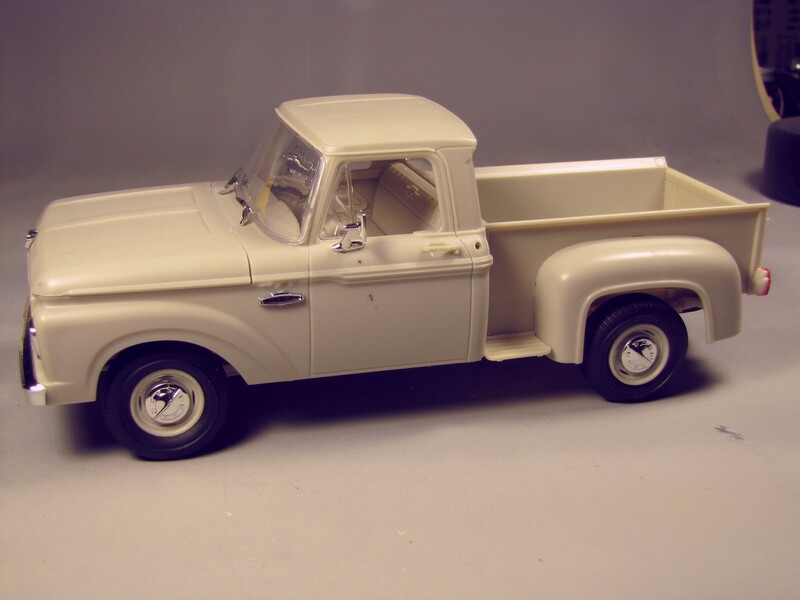 Back in 1960, people who had never even seen a '61 F-100 before were able to produce this from drawings. It's not perfect. They did miss one detail on the body. No use mentioning it. I didn't bother fixing it on the one I built or the one I'm currently building. I do have some experience with these trucks. I looked at a real one for almost seven years. Every day. To some folks, that might not equal the experience of someone who spent a day with one taking photos and measurements. But, whatever. Ok you 2 whiners, give me a example of a single perfect kit. You can't because they don't exist and never will. I know 2 people that have them in their garages and they see nothing really worth complaining about. Maybe you guys should start a model company and make perfect models. You know, and I know that there are few kits that are PERFECT, this one included...But if you produce a kit and DON"T expect some feed back then you have a problem, and if they can't take the feedback then they should just STOP selling this stuff..If you wish to buy it DO SO!!! But STOP with the personal attacks....you can defend how you feel without the personal remark midnite. Question. why isn't Art here to defend his model? BUSY?? And with all that said, I won't be back to this forum, I have better things to do than piss around with this crap. yes. Whiners. There is nothing major wrong with it. Minor perhaps, but not worth it. Art posted a bunch of pics on another forum. He's probably sick of all the negativity. well, count me in. I want one. prefer the styleside, short or long. what year grille will it get? Our family was a Ford dealer so I remember all of these when they were brand new. (not hillbillys with junk setting all over the yard) glue forever! IIRC both bed types will be done, not sure if the style side will be short or long, and I believe 65 and 66 are the model years. There are more photos on another forum.i don't blame Art for not posting them here.